I took typing class in high school. I don't remember if it was required, but in hindsight, I'm glad I took the class because it has been a very-much-used skill my entire lifetime. I'm using it now to write this. I'm not sure what brand of typewriters we had back then at Huntingdon High School, but I think they were IBM Selectrics. This was back in the mid-1970s, and yes, they had been invented by then. The electric typewriter was quite the hot item. The Selectric has this awesome auto-correct ability where you press a certain key and it backs up and whites-out the mistake so you can retype it correctly. No more gunky white-out. I went through several decades of life without touching a typewriter, as computers developed into tools of everyday use. Then several years ago, I acquired a bookkeeping gig that required me to type one 1099 form and one 1096 form each January. Because I was only doing one of each, I didn't want to invest in costly software and bulk packages of the forms. That left me with needing an "old-fashioned" typewriter to successfully handle the multi-part 1099 form. The old downtown Wichita Public Library had typewriters in the business section for public use. I went there for several years to do my annual ten minutes of typing. Once the new library was completed, I learned that the typewriters were not included, and that the new library doesn't even have a business section. Where could I find a typewriter? Meanwhile, my way-into-new-technology husband is trying to come up with ways for me to not ever need a typewriter again. Fortunately the office I work in during tax season is attached to a bank that has an electric typewriter. I used that one this past January to type my 2018 forms. We also use it occasionally to type an envelope or mailing label. It is quick, handy and useful. My co-worker and I set out this year to clean up our office space of old computer equipment and assorted ancient junk that had been sitting around for years. 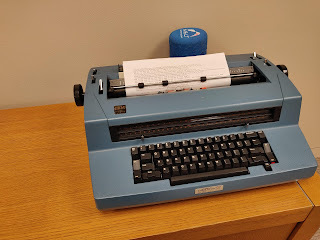 In one corner that I had truly never paid attention to, we discovered an IBM Selectric. Literally, I had worked there for a full nine months (over three tax seasons) and never noticed this typewriter in the corner underneath an old fax machine. Woohoo! Our very own Selectric! We moved it near an outlet, plugged it in, turned it on, and... nothing. It wouldn't start. Dang. Could it be fixed? The quest was on. I googled "typewriter repair in Wichita." Needless to say, there were not a lot of options. One phone number was disconnected, the second said "closed," and at the last option, the person who answered the phone said, "No one fixes Selectrics any more, you can't get parts." Off the Selectric went for George to resurrect. Fortunately George is a determined soul also, and he and Joe are good friends, because this was a lengthy job, mainly to de-gunk the ancient thing. This past Tuesday the Selectric returned to our office in perfect working order. By the way, I did George's tax return, and he makes enough money servicing typewriters that he gets some 1099s for it (that means he makes at least $600/year from an organization for the repair work). I'm not the only person around who finds a typewriter to be a handy tool. I've used the Selectric several times already. It works great. It feels like "my baby." It makes me giggle that it was able to be resurrected and restored to working order. George says it will work better the more we use it. If you are one of my letter-writing partners, you just may get a Selectric-typed letter from me next time. Albums and turntables have made a comeback, why not typewriters?!?! ?